Lyndsay Meyer and I made a quick trip up Hayden this morning before work. Such a fun ski! It was super pleasant up top. Too bad I had to get to work and couldn’t hang out. 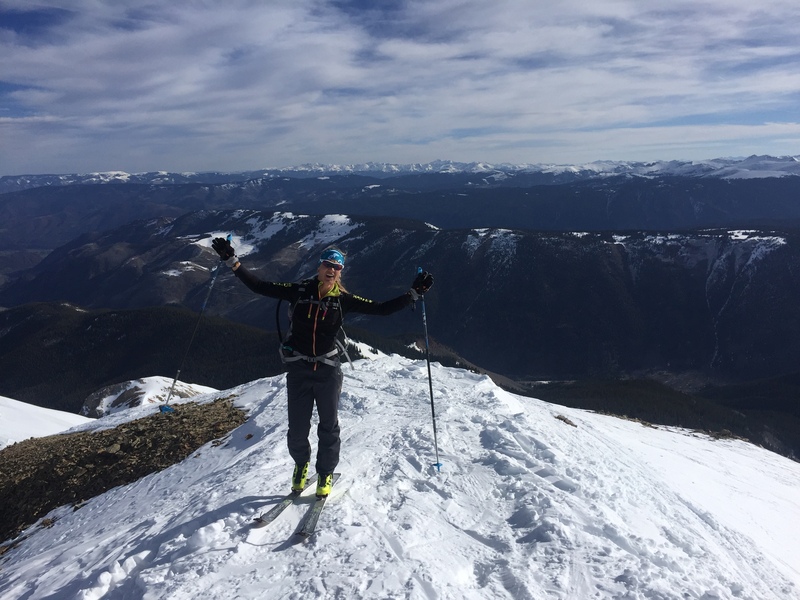 I had a chance to catch up with my friend and ski mountaineering teammate Lyndsay Meyer for Epic TV earlier this week–she interviewed me from France via Skype. Pretty cool! As I arrived in Geneva, the pilot informed us that it was 2 degrees Celsius, considerably colder than the 82 degrees it had been at home when I left. 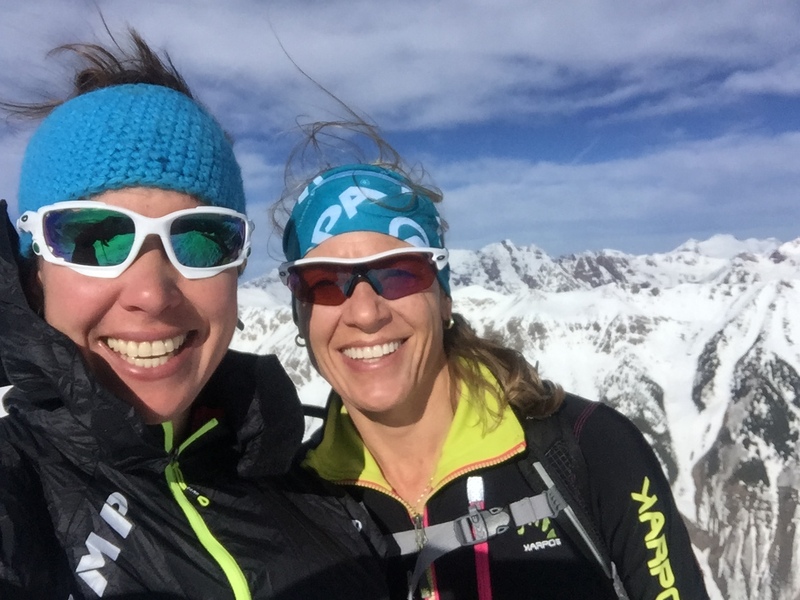 I bundled up for the drive to Chamonix to meet my teammates Lyndsay Meyer and Nina Silitch wondering if I was ready for skimo racing again after mountain bike racing in the desert the weekend prior. One of the first things Lyndsay mentioned was that a Foehn (pronounced phoon) wind was coming in. Having never heard of such a thing, I assumed this had something to do with a typhoon. Lyndsay also said that often people who commit crimes during the foehn winds in Switzerland, can have their sentences reduced because they make people temporarily insane. Oh, and they bring on migraines and raise temperatures by 30 degrees. With our race just two days away, we ignored the winds and started prepping our gear and ropes for the Patrouille des Glaciers. 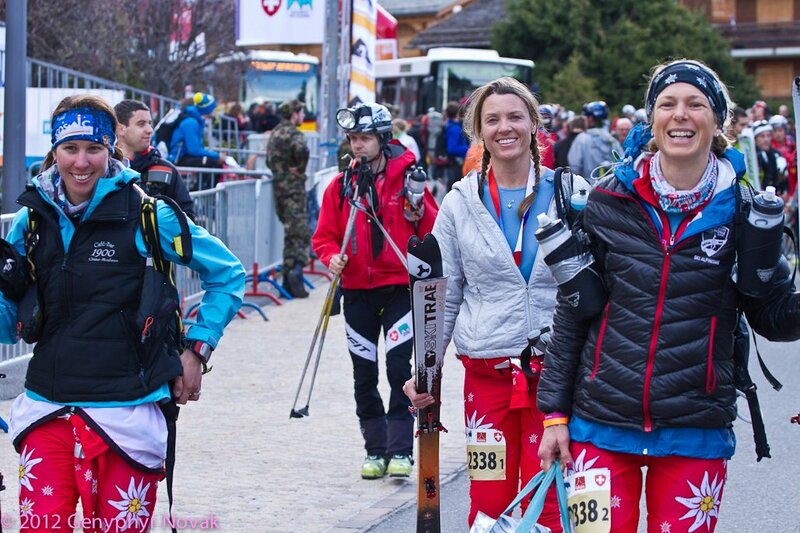 Thankfully both Lyndsay and Nina have raced the PDG twice, which occurs every other April. With their knowledge, we got ourselves dialed and headed to Zermatt for final preparations and instructions from the race organizers – the Swiss Army. 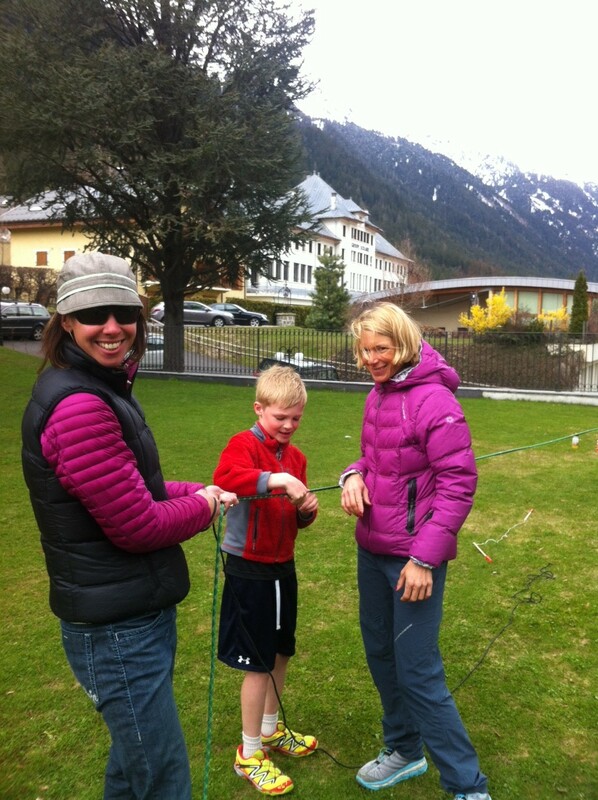 Nina and Sari get help from Nina’s son, Birken, prepping the rope. Just as we departed Chamonix, we heard news that the first wave of the race on Wednesday had been cancelled due to bad weather and poor visibility. Our race was scheduled to start on Friday night and we just hoped the weather would clear. The foehn winds and the weather was all anyone could talk about in Zermatt as the racers took over the quaint Swiss village. With reports stating that the weather would be worse on Saturday night, the Swiss Army decided to start the race as planned on Friday evening with the first group starting at 9pm and subsequent heats going off every hour until 3am. Nina, Sari & Lyndsay before the race. Nina, Lyndsay and I started with the midnight group, running with our skis and boots up the valley towards the Matterhorn for just over an hour. We felt the wind and the warm temperatures but didn’t quite realize we would face 100 kilometer per hour and stronger gusts as we gained elevation up to Tete Blanche. 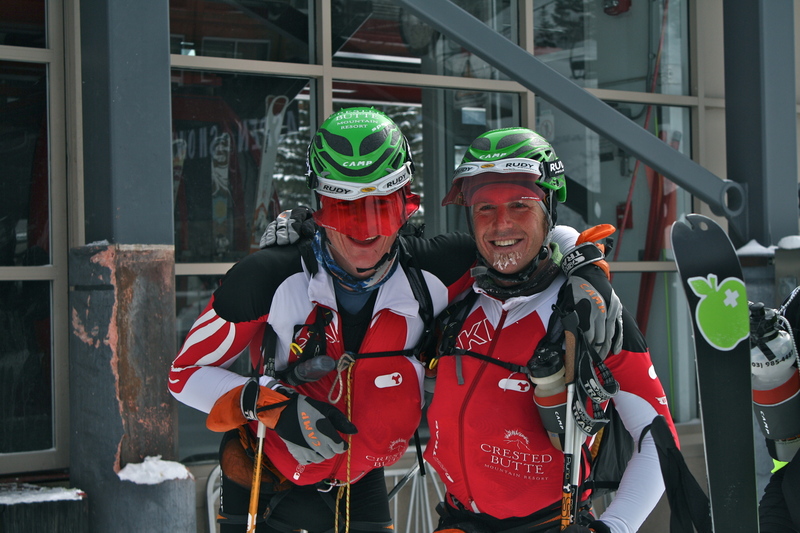 PDG course (from right to left – Zermatt to Verbier). We made it to Arolla. Avalanche was just after the Col de Riedmatten. Our team worked very well together as we climbed roped up into the strong winds. We were moving quickly passing teams that had both started with our group and before us. By the time we crested and headed down to the Dol de Bertol, we had all added our wind shells and down mittens as the winds grew stronger. My Polartec NeoShell proved to be extremely wind resistant in gusts that I had to brace for so I would not get blown over. 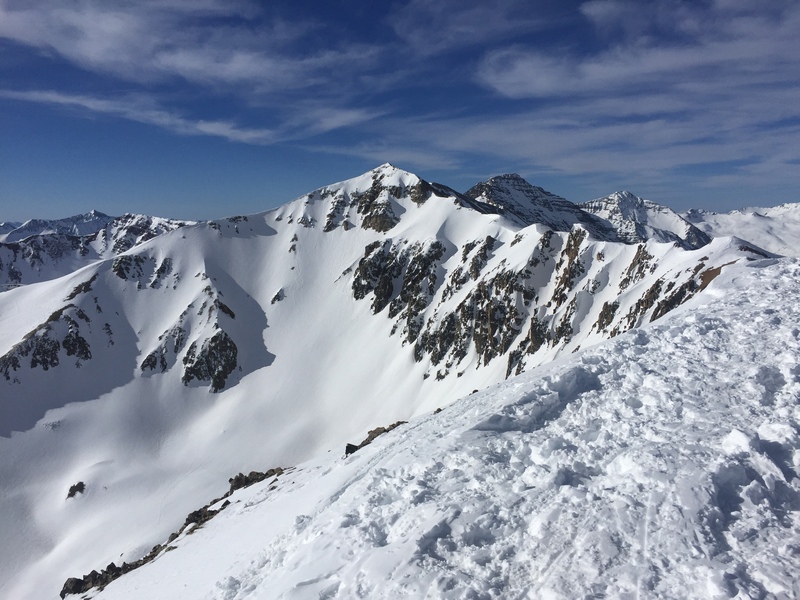 I am confident in my skiing and racing abilities, however I was the most nervous about the descent in the PDG where our team had to ski roped together. 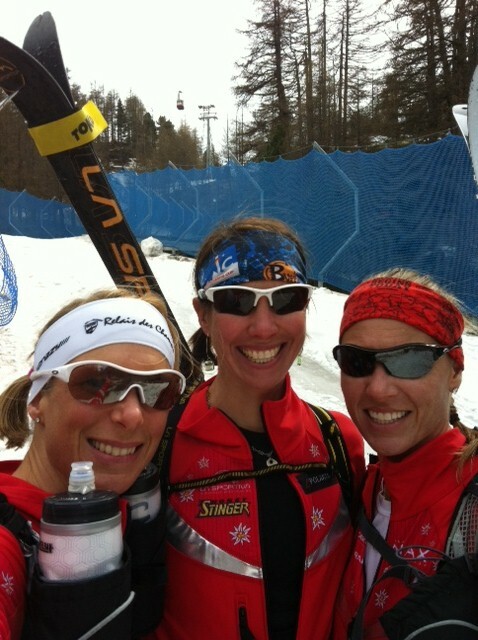 Both Lyndsay and Nina are amazing alpine skiers and I worried all season about slowing them down. The visibility was poor with all the blowing snow but with strong lights from Ay Up! we managed to ski fast and pass several more teams. With one more very short ascent while roped together then a large descent into Arolla, the halfway point, we were all starting to feel as if we were just settling into the race. As we reached Plan Bertol and a checkpoint, the wonderful mountain guide that was helping stuff the rope back in my pack, informed me that the race was going to end in Arolla. In disbelief, I apparently turned around and yelled somewhat loudly while blinding the poor man, ‘What? Are you kidding me?’ I was somewhat convinced he was practicing his English joking skills and wanted to see what my reaction was. It was windy, but we had passed the dangerous section on the glacier with the crevasses so I thought we would be able to continue. He assured me he was not joking. 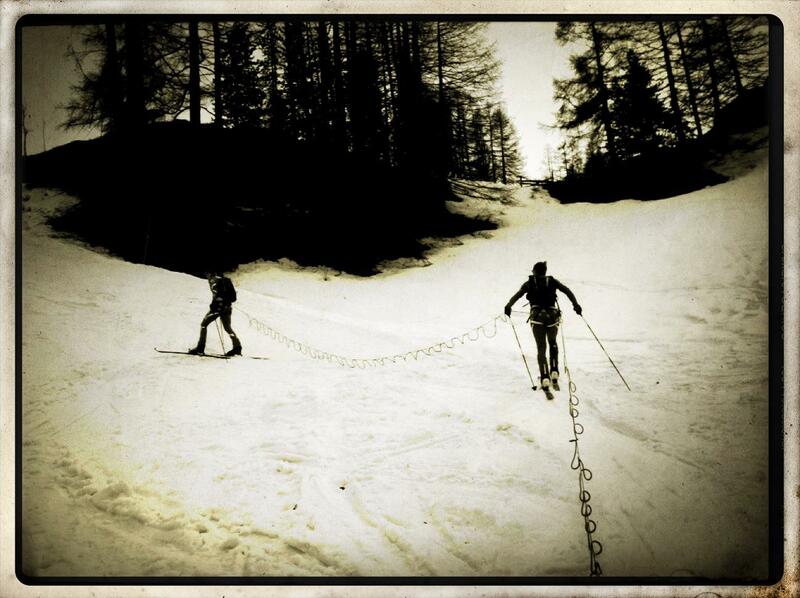 Adjusting to skiing on the rope was not as bad as I feared. Lyndsay was suffering from snow blindness in her right eye but it did not slow her down on the long descent into Arolla. We passed countless teams struggling to keep their speed up in the dark and finished the shortened race in just over 4 hours and 40 minutes landing us 7th place among the elite women’s teams. Once we arrived in Arolla, we met our support crew that had graciously spent their night standing in the wind to give us more food and water. They informed there had been an avalanche further on the course. Relieved to hear that no one was hurt but very disappointed we could not complete the entire course, we followed the Swiss Army’s orders and took the long and winding bus ride to the finish in Verbier. Although the bus crossed the finish line, it wasn’t quite what we had hoped for. Coming into Verbier after the long bus ride. Not exactly the feeling we were hoping for. With Lyndsay getting sick on our way back to Chamonix, we chalked it up to being nauseous both from skiing with one blurry eye and then the bus ride. However, as we arrived at the house, I soon became sick and we spent the entire day sleeping on the couch. We slept right through the 150 kilometer per hour foehn winds that tore roofs off schools and hotels, knocked hundreds if not thousands of enormous trees over and had the fire department supporting old buildings to prevent them from collapsing. Feeling much better on Sunday, we took a run on the trails and through town to assess the damage. Lyndsay and I realized what we had slept through while poor Nina had another sleepless night listening to the carnage around her home. We were thankful everyone was okay and mystified by what we had missed. As I fly home, I am thankful for an amazing trip to Europe to race in a sport I love so much. With my ski mountaineering race season officially over, I must thank many people for the successes I’ve had this year: My amazing husband and supporter, Ian, as well as my children Juniper and Axel; my parents for babysitting help for training sessions and races; La Sportiva for fast and light skis, boots and bindings; Polartec for my baselayers and wind protection; Honey Stinger for keeping me fueled; and The Max Marolt Scholarship for helping me get to the Patrouilles des Glaciers. Thank you all very much! 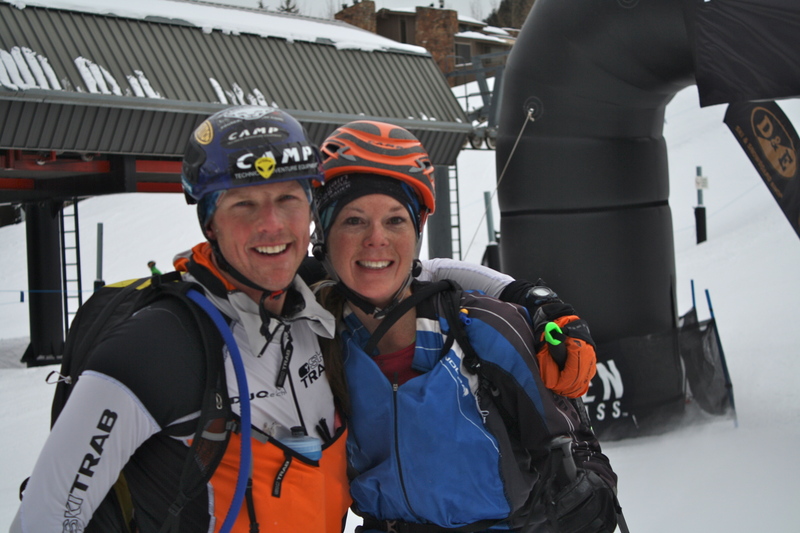 Lyndsay Meyer and I have been looking forward to racing the Power of Four Ski Mountaineering Race together for months now. Both of our partners last year ended up on IVs, one in the hospital and one at ski patrol. Although we both finished unranked without our teammates, this year we planned to complete the course together and hoped to finish strong in the women’s division. We decided to use a bungee cord tow system from the start, ensuring that we would stay close together. Racing in pairs can be difficult when teammates have different strengths, so a bungee gives a big advantage. I’ll spare you all the gory details of the race, but suffice it to say, climbing over 11,700 vertical feet over 26 miles is no easy task. Lyndsay and I worked well together – I paced on the uphills and she led the way on the downs. 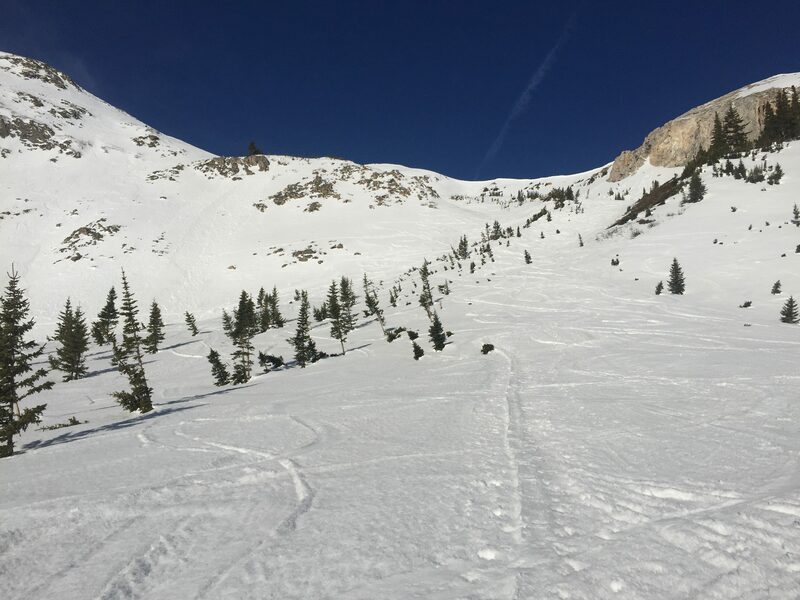 We both got pretty darn cold climbing up Highlands Bowl, where it was blowing over 60mph but we kept all our skin covered and thankfully avoided the nasty frostbite that a lot of teams suffered. 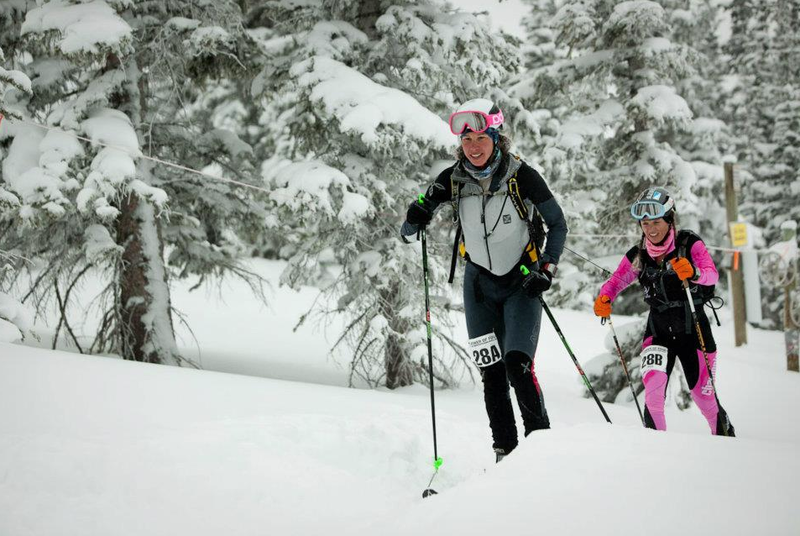 In the end, we finished in second place in the women’s division, with a time of 6 hours 28 minutes, behind the super strong women’s team of Stevie Kremer and Gemma Arro Ribot. 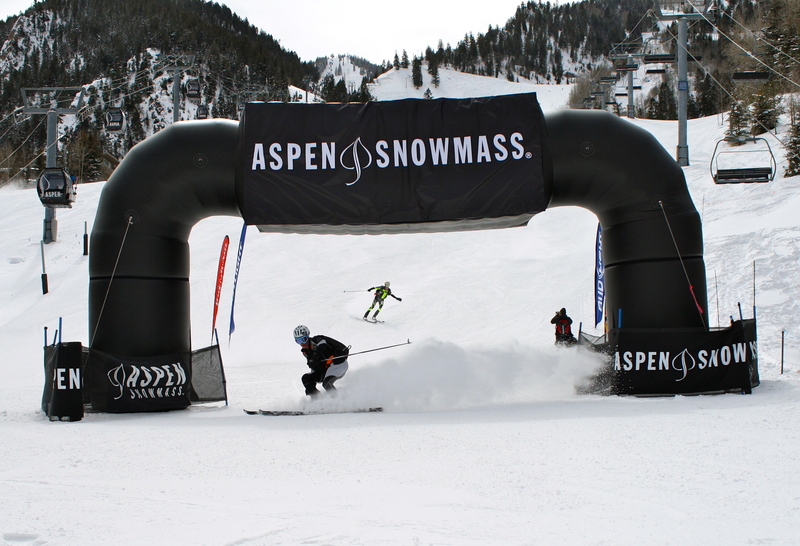 Here are some photos Ian took at the finish line. Overall winners John and Pete Gaston. 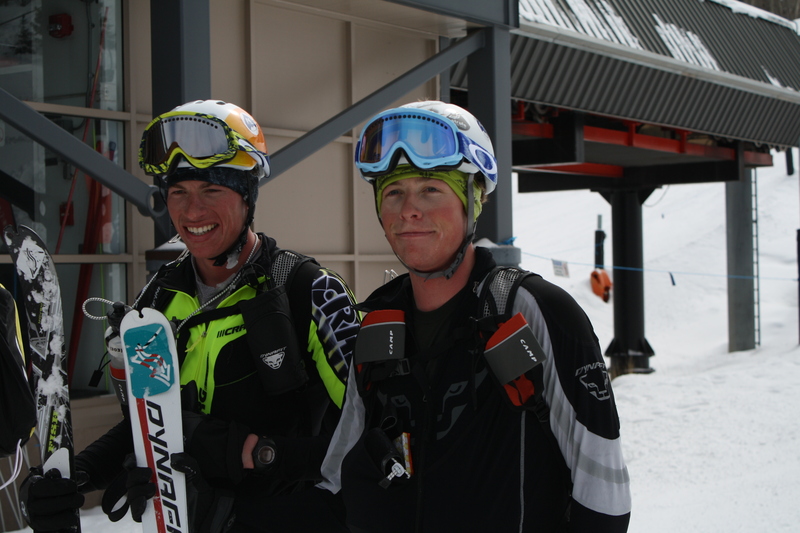 They beat Bryan Wickenhauser and Brian Smith by just two seconds. Read more here. A look of disbelief from Pete Gaston after hitting 60mph to pass the “Brians” just before the finish line. John and Pete. 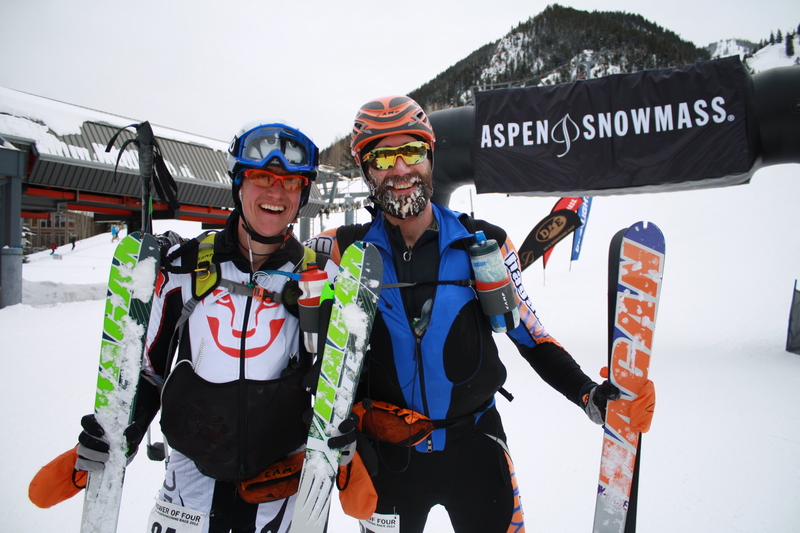 I raced the Elk Mountains Grand Traverse with Pete last year. Gemma and Stevie celebrate their hard-earned win. I have a love-hate relationship with the Teva Mountain Games (TMG). As I’ve mentioned in previous posts, I’ve competed in just about every version of TMG going back over 10 years. It’s been amazing to watch the event grow and evolve. 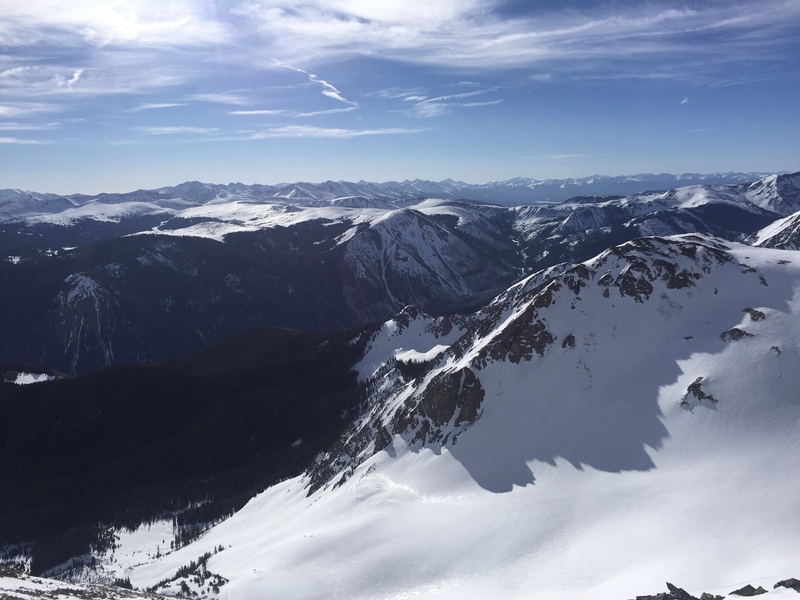 I look forward to the TMG weekend every summer – hanging out in my former hometown, catching up with old friends, watching all the amazing athletes competing, and of course, punishing myself in the Ultimate Mountain Challenge. 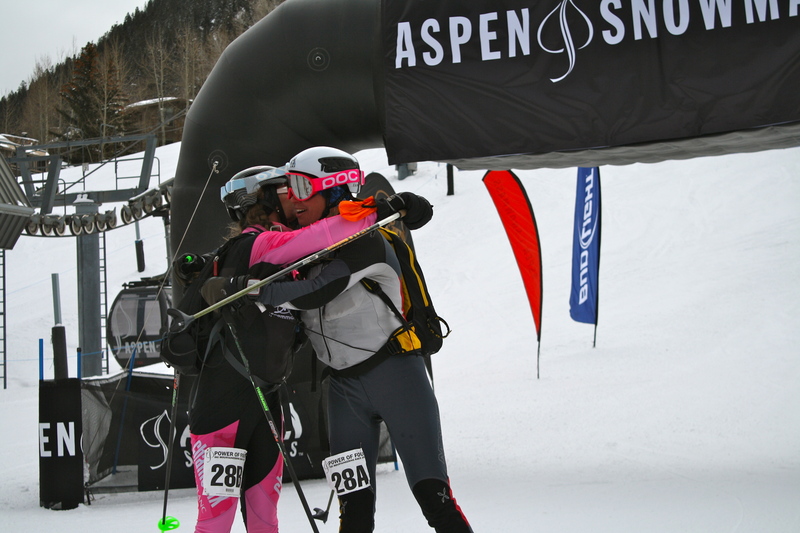 I also stress out more over the Teva Mountain Games than just about any other event I race in all year. The Ultimate Mountain Challenge in the summer, which includes four races over two days, is exhausting. I also feel like there is more pressure on me competing in Vail, and the expectations are high racing in front of so many of my friends. Furthermore, Ian works on the PR for TMG, so he’s talking about the event constantly. It gets to the point where I dread it. 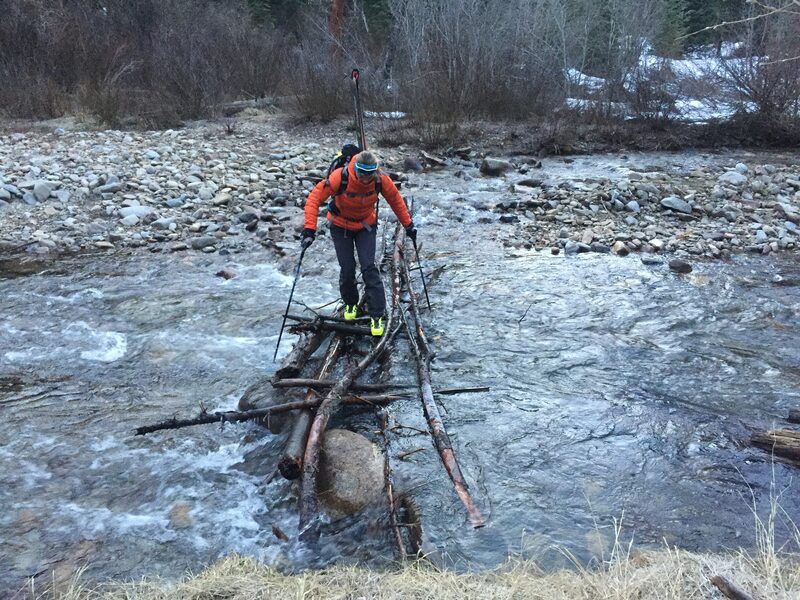 So, now the new, WINTER Teva Mountain Games is just a few days away and I’m getting more and more anxious. 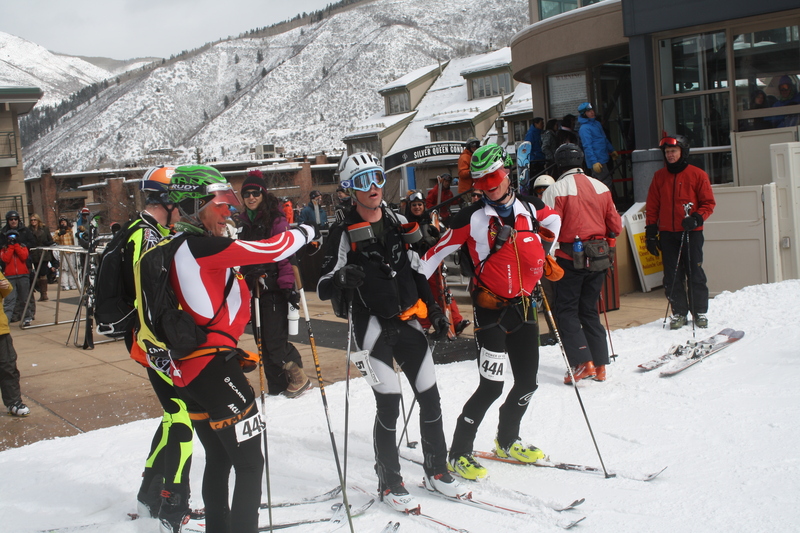 The winter version of the Ultimate Mountain Challenge includes a 10k Nordic race, a skimo race with 6,500 feet of vert and the two-mile, Vail Uphill race with 2,200 feet of vert. I feel fit for the race, but not totally prepared. 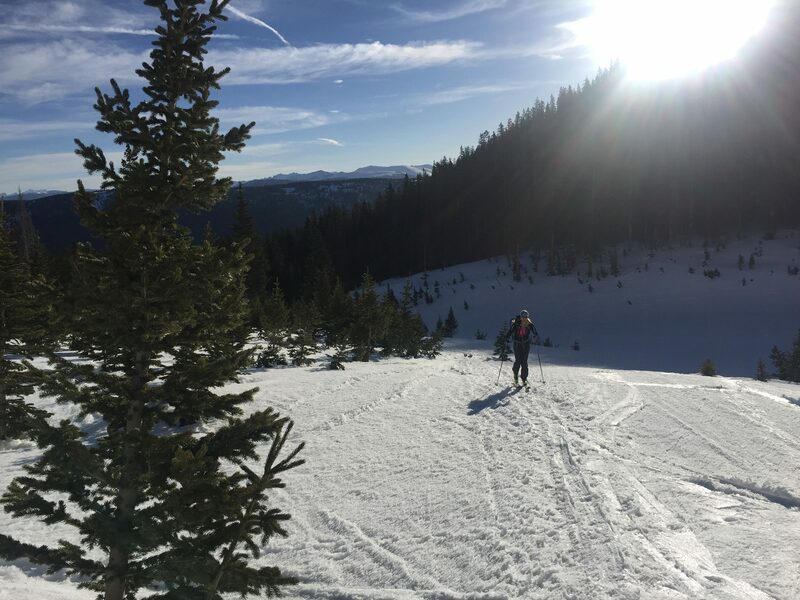 I skate skied for the first time all winter on Saturday. It hurt. I haven’t been running much, and definitely not uphill. 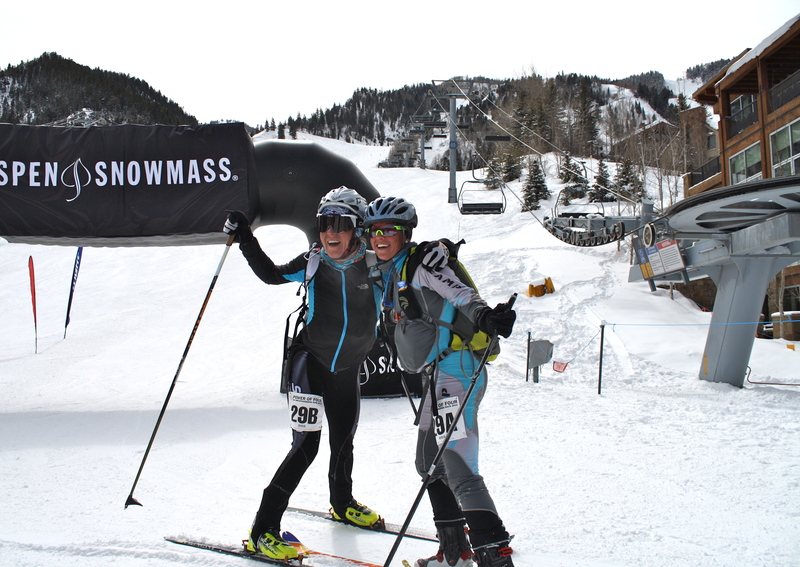 There are some strong women signed up for the UMC, including my friends Stevie Kremer and Lyndsay Meyer as well as US Mountain Running team member Megan Kimmel and National Nordic Champion Morgan Smyth. It’s going to be a really competitive race. 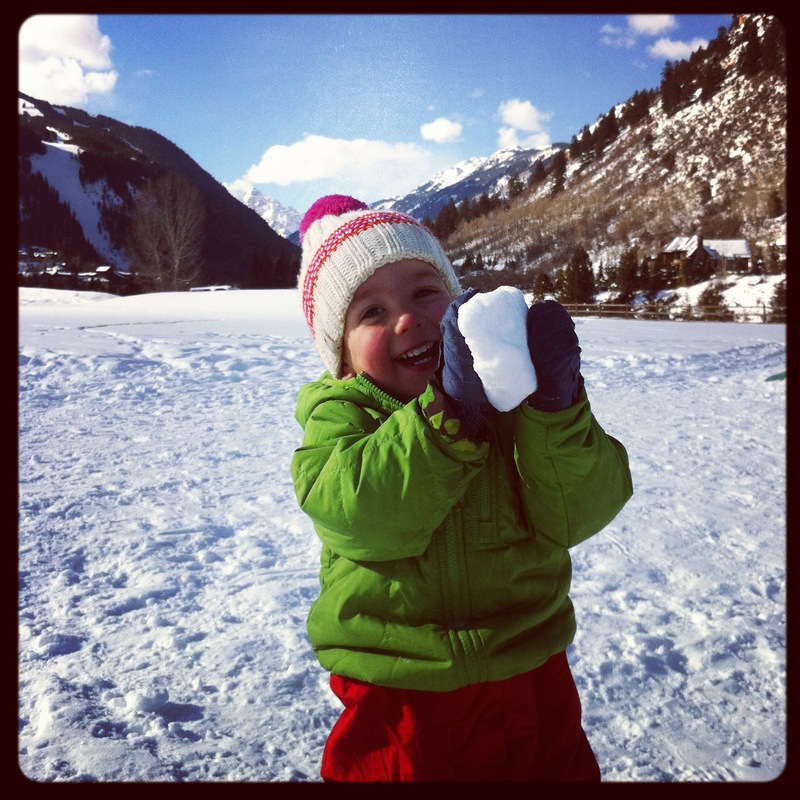 This weekend I’m going to try adopt Axel’s mantra…just have fun in the snow! Hope to see many of you in Vail. Thanks, as always, for reading.